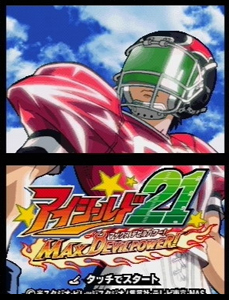 Eyeshield 21: MAX Devil Power! With what is one of the best subtitles ever, Eyeshield 21: MAX Devil Power! for the Nintendo DS Japan is one of the greatest games I have played. Based on an anime of the same name, Eyeshield 21 is what Japan thinks of American football, fast paced and full of awesome power. The show focuses on Sena Kobayakawa, main character of the series. He is a running back. He is an amazing runner, his jersey number is 21, and he wears an eyeshield to hide his identity, hence the nickname “Eyeshield 21”. The game is for the Nintendo DS in Japan only and hopefully will come to America. Think Elite Beat Agents meet Madden and you will get why this is so cool. Read up at Gamespot on Eyeshield 21.